S.H.Figuarts Sailor Mars – MoonFigures Collection, Art, and Reviews! Sailor Mars, also known as Rei Hino, is the unexpected best friend of Sailor Moon, and a sort of center for the group outside of Usagi. Throughout the entire series Usagi and Rei bicker to the point of making the viewer wonder why they’re even friends to begin with? Their friendship starts with a strong hit to the face with an Ofuda as Rei mistakingly believes Usagi is some sort of evil entity. Their true friendship is proven when Rei is trusted with the Crescent Moon Wand as they mock fight for leadership in order to trick the enemy. There are also various scenes and episodes where Rei is attacked or dies where, while Usagi is clearly distraught over other characters as well, she runs to Rei. Rei is a Miko at Hikawa Shrine, owned by her Grandfather, and her specialty is in the paranormal and with fire. She is often found meditating and consulting spirits for the missing piece of the puzzle. Oddly enough Sailor Mars has been given a strange colour theme on her box. Purple, green and yellow. Fans have seemingly accepted the purple as alright (although many question why not red? ), but the green corner has everyone confused. On both Moon and Mercury’s boxes this corner was yellow. Personally, I think it’s ugly, but I bought the figure for the figure, not the box. For Sailor Mars her TOEI sticker is usually located above the 20th anniversary logo. For the international release it might be located beside or above the International logo. Despite pictures, everything came sealed. My Mars was opened for pictures previous to my review *gasp* So the base should be wrapped in a plastic bag. Of course, like Mercury and Moon, Mars has a casing for the faces and hands. This casing unfortunately doesn’t include the hand that holds her Ofuda though. As with Sailor Mercury, Sailor Mars did not get much advertisement. Photos were posted on the Tamashii site, and an AmiAmi review got her lots of wonderful photographs, but there were no advertisements or commercials. She did (and probably will) see lots of events from a display case though! Sailor Mars comes with 21 pieces, so far the least of the 3 Senshi released. Her special parts include a hand piece that fits both arms for Fire Soul, as well as an Ofuda and hand to hold it. Mars joints seem to hold together well. She also has 2 jointed hair pieces for effect that seem to roll smothly. Despite no issues with mine, I’ve read some complaints about loose leg joints, as well as a case of the leg snapping off at the knee upon opening and posing the figure. These should not be common issues, but contacting Bandai Japan for replacement parts would be a good first step, instead of purchasing an entirely new figure. Mars comes with 4 different face plates that ultimately suit the character, but don’t offer much variety as 3/4 faces are angry attack faces. I guess they watched all of the episodes where she was frustrated with Usagi while picking expressions. I edited this picture as darkly as possible to show the paint choices. 5 of her hands appear to have a pink base to them, while the other 6 are pearl white. Some of these are attack hands, so it’s possible they thought it would suit her fire attacks? Her body matches the pearl white hands, but it’s not particularly noticeable in the photos whether I’m using a pink hand or a pearl white hand. The peg for her hand is similar to Sailor Mercury’s so it’s possible their hands will be compatible with each other. After Sailor Moon and Sailor Mercury there really isn’t much to be said about the sculpting. Like the last two Sailor Mars’ head leans forward just a little too much, but posing her and playing with her position allows you to find good spots where her head doesn’t look awkward. 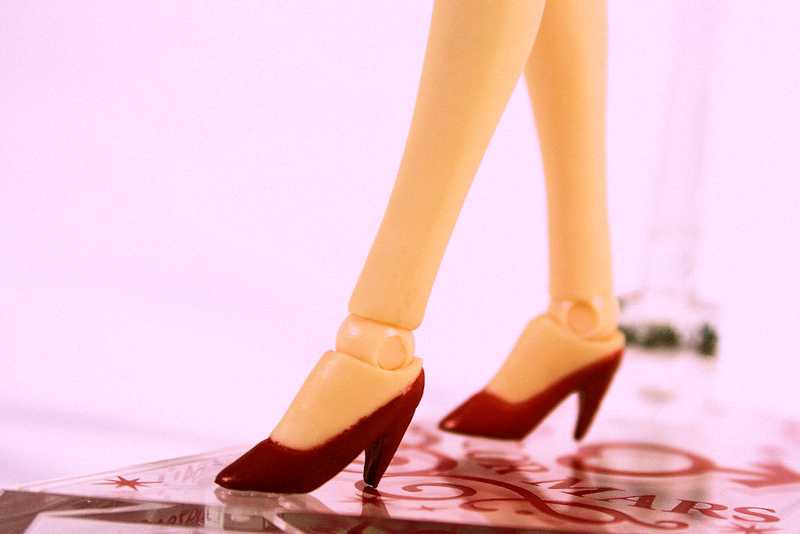 The worst feature on Sailor Mars is in her ankles. While Moon and Mercury have the same ankle joint, both of those characters wear boots where this sort of blends. 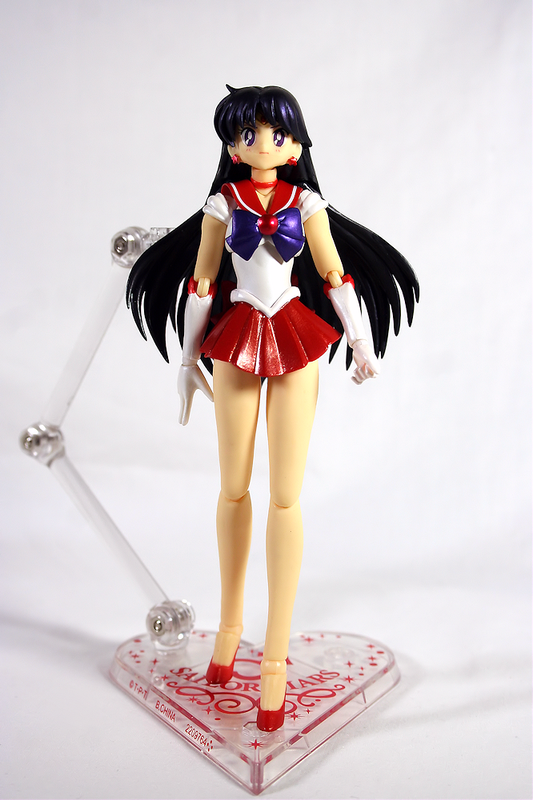 For Sailor Mars it just stays obvious, and it looks like she has swollen ankles that don’t suit the rest of her body. Because of the flexibility in how the feet may be posed her joints aren’t hidden slightly in the legs, but are mostly exposed. In regards to the usual Figuarts/jointed figure design there isn’t really much they can do to hide this piece, especially on a character with bare legs and ankles. But for Mars in particular it stands out as distracting. Unfortunately for Sailor Mars, posing her is difficult. Because Sailor Mars has long hair it is extremely difficult to pose her using the base and arm she comes with. Her hair gets in the way of the arm, and the only way to use it properly is to turn her head sideways (seen above) or lift her hair, which in turn makes her look down. To make it all the more difficult she is nearly impossible to pose standing without her base because her hair is so heavy. Her hair is very detailed, and there are two pieces on ball joints that move. If positioned correctly they are great assets for a good pose. The usual bad spot on these figures is the brooch. Sailor Mars is perfect! It’s super clean, the bow looks nice, the collar looks lovely, so does her choker, arms, and skirt. The skirt isn’t all around that bad either. Where the skirt meets the white piece around the waist it’s not quite smooth, but it’s about as clean as it will get at such a small scale. This is where my concern begins for the paint. There are 3 smudge marks on her back, as well as a mark on the collar that I am unsure about. I’ve contacted Bandai, but I haven’t heard back from them yet. The base for Sailor Mars resembles Sailor Mercury’s, and does not have the flexibility of Sailor Moons base arm. The claw also appears to be the same as Sailor Mercury’s. As mentioned previously, the base is really annoying to use with Sailor Mars as her hair gets in the way of the arm and claw. Most likely you’ll have to turn her head left or right to make it work. This can be REALLY annoying when you have a display in mind, and it makes it impossible to use. I have managed to pose Mars, and prop her up on the base with the arm instead of clamping it around her waist. As Sailor Venus will have very similar hair, I expect this to be an issue with her as well. I feel like from a distance and on display Sailor Mars is perfect, but playing with her might be an issue. You’ll always see more criticism than praise, but I feel like I’ve read a lot of complaints or issues ranging from the box, to actual figure defects. Issues like defective parts and paint spots will never really disappear completely as no company in their right mind will QC proof every single figure. For the set I highly recommend Sailor Mars, but I also recommend cracking open the box and checking her for defects. The chances of getting a defected piece should be very small. Most of the complaints I’ve heard have been on MFC, but not on Tumblr, or from friends who collect. So in a place that complaints would generally be posted.